Well folks, my Secret Pal has done it again. What a super package and a real surprise this morning. 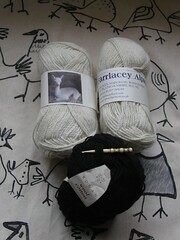 Some cream alpaca yarn from Farrlacey Alpacas which is just so lovely and soft. She also included some black Rowan wool cotton, which you can never have too much of and the teeniest baby bone crochet hook. It has a darling turned handle and is about 2″ long. Thanks SP, you’re fab.